Let’s face it: there are a lot of software options available in the MarTech world that marketers can use to help get their jobs done efficiently and with better data. As we try to have deeper and more personal digital conversations with our prospects and customers, is there truly an “all in one” solution that can help us understand both the big picture and the granular data on how, where, and why are our content is being consumed? We are big HubSpot fans at WSOL, a software platform that provides a free CRM and cost-effective marketing and customer service stack that is really good at being the repository for all of your customer/prospect interaction data. But it doesn't have all of the technologies most businesses need to execute on all things digital. This is where integrations come in, through the HubSpot Connect program. Whether developed by HubSpot (native) or offered through established partnerships with HubSpot, these integrations can help you avoid data silos. For those of you who aren't familiar with Zapier already, it allows you to build connections and automation workflows (known as Zaps) between multiple platforms/software. This means you can connect HubSpot to just about any other platform you may be using and pass data between the two. For example, you could create a Zap that when a form is filled out you can give a shout out on Twitter to the person who filled it out. Best of all, if you're not as tech-savvy as other, Zapier uses a visual builder to create your zaps so you can do it with ease! There are currently well over 500+ prebuilt zaps across multiple platforms, so we would recommend giving Zapier a try with your HubSpot portal. One of the greatest tools for interoffice communication and collaboration (and even client when you use single channel guests) is Slack. They also have a direct integration into HubSpot. This integration allows you to create tasks and tickets straight from Slack messages and also add Slack Notifications through HubSpot’s Workflows (Marketing Hub Enterprise, Sales Hub Enterprise, and Service Hub Enterprise only). Another great feature of this integration is the ability to trigger direct messages in Slack for a variety of notifications from HubSpot. If you're looking for a great proposal/contract software that gives you the ability to create, send, and track client facing documents with the ability for eSignatures that also works with your CRM, look no further. PandaDoc's integration into HubSpot allows sales folks to build and send documents from inside HubSpot while also providing you all the tracking metrics directly onto your contacts timeline events. While there are a lot of alternatives out there to PandaDoc, they were one of the first eSign Document connectors and are still the most popular of them all. As one of the top SaaS based ecommerce systems on the market, HubSpot recently has built a direct integration with Shopify. This integration allows you to sync your customer data between HubSpot and Shopify while giving you the added bonus of mapping over your products into HubSpot Products and your sales into HubSpot’s Ecommerce Pipeline. For those on the Marketing Hub Basic, Professional, and Enterprise Editions, you also get the ability to segment lists based on the products people have purchased. But wait, there’s even more to this awesome integration. If you are on the HubSpot Marketing Professional or Enterprise Plan, you also get 3 default workflows added for: Welcoming New Customers, Following up on Abandoned Carts, and Re-engaging with Old Customers. This helps harness the power of HubSpot’s workflow automation to really bring you A game when it comes to your ecommerce. One of the very first connectors HubSpot ever had was with Salesforce. For those who don't know, Salesforce is a Customer Success Platform with a very robust CRM that has been around awhile. Many major companies have turned to Salesforce for their CRM needs. HubSpot has very tight knit integration in Salesforce and gives you the ability to view HubSpot related insights in your Salesforce CRM such as the contacts likelihood to close, their activity timeline, and even the ability to enroll contacts into workflows. You can also sync contacts and leads from Salesforce into HubSpot and when mapping fields you have the ability to set when HubSpot should update the corresponding Salesforce field. 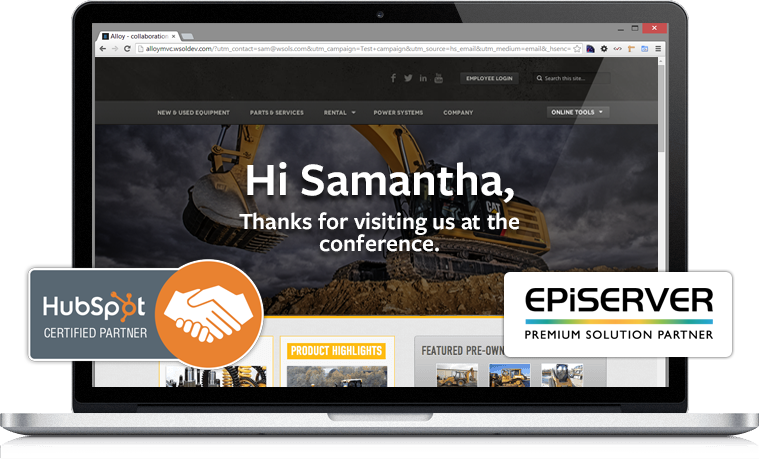 A list of great HubSpot integrations wouldn’t be complete without a mention of our own WSOL created tool that merges the inbound marketing intelligence of HubSpot into the premium content management experience of EPiServer. The HubSpot-EPiServer Connector allows you to create unique visitor experiences based on a user’s previous history and current lead status, connect HubSpot email campaigns to website content for first time website visitors, and add HubSpot forms directly into EPiServer content using easy drag and drop functionality. These are just a handful of the integrations we talk about most often with our clients, but you can view the full list of native HubSpot integrations and partnership integrations here. Leveraging these integrations to pull all of your marketing technology resources into one spot can result in a huge increase in efficiency and help bring success to your inbound marketing campaigns. Do you have any questions about inbound marketing or how marketing automation can help you avoid data silos? Do you need help determining which HubSpot integrations to use or setting them up? Please contact us, and our inbound marketing experts will work with you to create a successful digital strategy.